The thick lava flows comprising the Columbia River Basalt Group (CRBG) in the US state of Washington, and adjacent parts of the state of Oregon, contain a significant number of pillow lavas and palagonites—all indicative of subaqueous extrusion. Individual lava flows invariably show ‘knifesharp’ contacts between flows, which is consistent with the flows occurring one after the other in rapid succession. The nature of these contacts is inconsistent with the uniformitarian time intervals of millions of years indicated by isotopic dating. Claimed ‘weathered horizons’ and ‘fossil soils’ between individual lava flows are very uncommon, suggesting they are the product of chemical reactions between the hot lava and water, not fossil-soil material. The observations are consistent with the lava flows being extruded catastrophically, emplaced rapidly and cooled quickly, all during the global Flood recorded in the Bible. Taken together, the features of the Columbia River basalts suggest that they were mostly extruded and emplaced during the Late Abative Phase of the Recessive Stage of the Flood. During the summer of 2001, the authors conducted a field trip to the extreme north-west part of continental USA (Figure 1). We covered parts of the states of Washington (WA) and Oregon (OR) and were episodically joined by creationist geologist Dennis Bukovoy, as well as John Hergenrather and Steven Sparkowich. The rectangular area studied extended approximately 300 km east to west, and 150 km north to south (bound by 45o30′ N to 47o30′ N and 117o30′ W to 120o00′ W). Observations of the Channeled Scabland, left over from the Lake Missoula glacial flood, were a highlight of the trip. In addition, some 50 outcrops of Columbia River basalt were observed or examined closely, and these are the subject of this report. Figure 1. Outcrops of Columbia River basalts (shaded), most of which occur in Washington (WA) and Oregon (OR). THe entire geographic outcrop region, with the exception of its extreme eastern and extreme southern portions, was visited during this field trip. Were these lava flows emplaced gradually over many millions of years? Not likely. To begin with, textural evidence, reported by others, indicates that the lava flows responsible for the Columbia River basalts have traveled some 750 km without significant changes in temperature,6 and this implies ‘extraordinarily rapid emplacement.’ At this speed, the torrents of advancing lava flows must have overwhelmed and entrapped much of the surface material that lay before them on the earth. We observed several instances where material was overlain by the lava flows. Figure 2 shows one such case where a large mass of fossil wood, shaped like a lens, was entrapped beneath a lava flow. Even the textural features of the wood are evident. Figure 2. A large lens of fossil wood sandwiched between lava flows, near Lyle, WA. The upper contact shows the underside of pillows (‘elephants toes’—marked by arrow). The horizontal later marked by the hammer (circled) contains actual fibres of wood. This lens extends a considerable distance normal to the outcrop, as proved by the continuation of the lens in the outcrop face located on the other side of the road (not shown). Figure 3. A row of coplanar solitary colonnades, near George, WA. The banding in the lava above John Woodmorappe’s head indicates differential shrinkage during the cooling of the basalt. Naturally, if there is any indication at all of slow flow, some uniformitarian geologists are bound to highlight it. A number of geologists have done just this, providing an apparent mechanism for slower flow.16 The main evidence is pahoehoe or ropy lava texture at the top of some flows. Stephen Reidel, who researched the CRBG for 25 years, does not accept these arguments (although we believe he would like to, because rapid emplacement poses a major problem for the uniformitarian viewpoint). In any case, the apparent evidence for pahoehoe lava is largely restricted to the periphery of the flows, where the rate of advance would have slowed considerably.17,18 This is also the area where pillow palagonite19 complexes and most interbeds are observed. Entablatures and colonnades are common structural features of basalt. They are named by analogy to the respective horizontal and vertical architectural structures prevalent in classical antiquity.20 Entablatures commonly comprise well over half the thickness of a flow.21 They do not, by themselves, give unambiguous information about the cooling rate of the lavas.22 However, entablatures can solidify and cool very rapidly by water-steam convection.11,20,23 The columnar jointing observed in basalts implies rapid cooling. As described elsewhere,24 water at first only cools the outer ‘skin’ of the lava flow, forming a thin, solid ‘crust.’ The huge temperature gradient between the crust above and the still-hot lava below creates tensional stresses that crack the crust. Water then percolates into the cracks, and the cycle repeats itself. In the end, this rapid, cyclical cooling process produces a thick slab of rock with columnar jointing. Roughly a quarter of the outcrops we observed showed some degree of columnar jointing. In extreme cases (Figure 3), giant colonnade ‘chimneys’ stand alone in eerie silence, having resisted the erosion which removed the surrounding basalt. 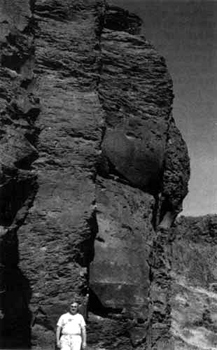 In other outcrops, the colonnades resemble organ pipes emplaced within the basalt (Figure 4). 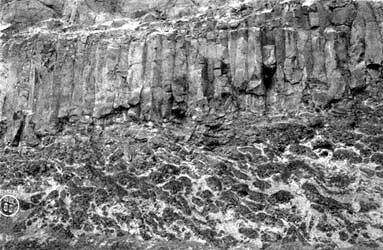 Often, there are several horizons of columnar basalt in a large outcrop, interlayered with entablatures. Viewed from a distance, these narrow horizons of colonnades resemble ‘stitchwork’ on the outcrop surface. In other outcrops, the columns are not fully developed, and resemble superficial vertical ‘slices’ within the basalt. Figure 4. A layer of colonnades within the basalt, overlying basalt containing numerous pillow structures. The pillow lavas are indicated by the ‘ellipses’ (light-colored palagonite bands around each of the usually oval-shaped pillows). Near Dallas, OR. The scale is provided by a road sign (circled, extreme left-bottom). We observed that at least a few pillow lavas occur in one out of ten or fifteen outcrops. The actual frequency of pillow lavas, however, is probably significantly greater than this estimate, for at least two reasons. To begin with, most pillows are small, and most outcrops we observed were from a fair distance. Second, most pillow lavas occur at the base of individual flows. These would not be readily seen unless there is some local erosion immediately under the pillow-containing flow, and the observer happens to be situated at the appropriate angle to see the underside of the lava flow. For instance, note that in Figure 2 the small pillows resemble ‘elephants toes,’ and can only be seen because there is a slight gap between them and the underlying fossil-wood layer. One would have to lie on the ground to get a reasonable view of the pillow lavas. Figure 5. Closeup of a prominent pillow structure, near Vantage, WA. Note the layered bottom contact (arrow) and palagonite grains surrounding the pillow. In most outcrops, pillow structures cover only a few square meters of the outcrop. However, there are a few outcrops where tens of metres of vertical outcrop and hundreds of meters of horizontal outcrop consist entirely of interfingered pillow structures. The entire bottom half of Figure 4 shows an example of this. In other locations, pillow structures are prominent in all three dimensions (Figure 5). In the figure, the sand-like material surrounding the pen is palagonite, a greenish-yellow reaction product of hot lava and water. The arrowed layering immediately underneath the pillow structure is a series of rapidly-cooled contact layers between the lava and water. 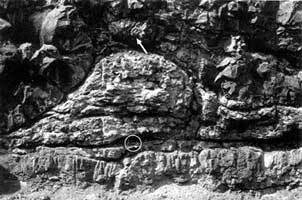 Although pillow lavas clearly indicate underwater deposition, it cannot be overemphasized that lavas can be extruded subaqeously without producing pillow structures.26 The potential to form pillow lava decreases as the volume of extruded lava increases. The volume of lava increases as the third power but surface area only as the second power. Thus, the effective contact area between lava and water (where pillow lavas can potentially form) becomes proportionately smaller as the volume of lava extruded becomes larger. So also, for similar reasons, the probability becomes smaller that a subsequently-formed erosional surface (outcrop) will happen to expose pillow structures. There are a variety of additional evidences, which indicate that most, if not all, of the Columbia River basalts were extruded underwater. These include marine fossils (such as sponge spicules, diatoms, and dinoflagellates) between lava flows, and numerous areas of well-rounded, exotic quartzite gravel, cobbles, and boulders locally interbedded with the flows (but mostly lying above the basalt).27–29 The quartzite clasts, some of which lie 1,000 m ASL (above sea level) upon lava anticlines and 2,500 m ASL on ridges of the Wallowa Mountains, north-east Oregon,30 indicate high-energy transport over long distances. The indicators of much subsequent erosion, such as smoothly eroded lava anticlines in the Yakima fold belt, and water gaps, are also consistent with a submarine origin for the basalt flows.29,31 Considering all these evidences, we conclude that the Columbia River basalts were deposited during the Flood, not after the Flood. Figure 6. ‘Missing’ geologic time, near Bingen, WA. Note the three layers of partly-covered basalt in the center of the photo, each separated by a knifesharp contact. There is no evidence of an irregular contact with gullies as would be typical of an erosional surface. To the contrary, despite the fact that a few millions of years are supposed to have elapsed between the lowest and its overlying layer, the contacts are astonishingly conformable. We address the question of whether there were appreciable intervals of geologic time between different layers of Columbia River basalt as claimed by uniformitarian geologists. Potentially, supportive evidence would be the presence of extensive valleys or gullies cutting into lava flows, and filled with successive lava flows. Another would be the presence of thick beds of basalt boulders between successive layers of basalt. It is almost astonishing to report that both are conspicuously lacking. To the contrary, in most locations, interbeds between lava flows are essentially nonexistent, and, when they do occur, they are thin, uniform in their thinness, and found mainly at the periphery of the flows. The lava flows themselves consist of monotonously thick layers. Nowhere did we observe anything resembling a valley, or boulder bed, between successive lava flows. What about those superposed lava flows, which, according to isotopic dating, are anywhere from hundreds of thousands to several millions of years apart in time? One such location is shown in Figure 6. Is this example from the Columbia River basalt unusual? No! It is common for ‘ghost’ uniformitarian time intervals, and much greater ones than those discussed above, to be inserted into vertically (and also horizontally33) contiguous lava flows. For example, the Plio-Pliestocene Rampart beds of California (USA) yielded isotopic dates ranging from 1.4 Ma to 2.56 Ma, but this range of dates is admittedly difficult to accept because of the absence of deep erosion or soil horizons between superjacent lava flows.34 As another example, the Lincoln Porphyry of Colorado (USA), was originally mapped as a single unit because of the geographic proximity of the outcrops and the mineralogical and chemical similarity of the igneous body throughout its extent. It is therefore incongruous to find that parts of the Lincoln Porphyry are 29 million years apart in time, according to isotopic dating.35 As a final example, consider the Garrawilla Lavas of New South Wales, Australia. These are bracketed between Upper Triassic and Jurassic sedimentary rock. Yet these lavas, over a large horizontal scale, grade imperceptibly into lavas which overlie Lower Tertiary sedimentary rock. Consequently, the latter lavas are considered younger, on an ad hoc basis.36 Otherwise, geologists would have to acknowledge that there is actually only one set of lava flows, and that everything between Jurassic and Early Tertiary is contemporaneous! Figure 7. Claimed weathered layer (supposed laterite) of Columbia River basalt (bottom half of picture, sandwiched between near-horizontal layers of grass growing on the outcrop), and overlain by a layer of unweathered Columbia River basalt (top half of picture). Near Kahlotus, WA. The contact zone between unaltered and altered basalt is marked by a hammer (circled). Although we could not locate convincing field evidence for long periods of time, we realized we needed to be cautious. We did not want to be guilty of selecting evidence that supports a young-earth position and overlooking contrary evidence. For this reason, we asked local creationist geologists, very familiar with the geology of the area, to show us any apparent field evidence for ancient soils. On an earlier field trip, Harold Coffin had shown Mike Oard the location shown in Figure 7. During the present field trip, Dennis Bukovoy called our attention to the area shown in Figure 8. First of all, it is interesting that these supposed laterites become an extreme type of laterite called bauxite near the west coast of Washington and Oregon.37 Based on present-day occurrences, bauxites are interpreted to form in a hot, wet equatorial climate. However, this does not square with the much-cooler paleoclimate in Washington and Oregon during the Miocene,38 also inferred from standard uniformitarian thinking. It is more reasonable that bauxites, as well as laterites, formed by processes not observed today, most likely during the Flood. Figure 8. Alleged fossil soil underneath layer of basalt, near Hood River, OR. Creationist geologist Dennis Bukovoy (right) provides the scale. The ‘soil’ consists of the recessed, horizontal layer occurring at the same level as Bukovoy’s torso. Black and white photography does not do justice to these ‘weathered’ surfaces. Consider Figure 7. In color, the overlying basalt is the usual gray-black, but the underlying ‘laterite’ layer, occurring below the grass-covered basalt layer, is a bright, fire-truck red. When broken by the hammer, the allegedly-weathered basalt displays a somewhat-friable, dull pink-orange texture. 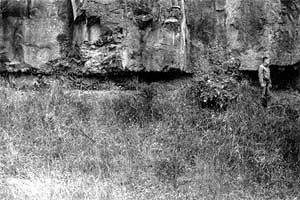 The vertical grass-free zone near the hammer (contact zone) represents the unsuccessful attempt by Woodmorappe to excavate enough talus to show the exact point of contact and reveal whether or not a conglomerate is present. Consequently, for now, the only evidence suggestive of long periods of time is the altered state of the subjacent basalt layer. What are we to make of these alleged indicators of long periods of time between basalt flows? Pending a detailed investigation of the composition of these ‘laterite’ and ‘soil’ features, and an understanding of all of the processes that can lead to their origin, we must put them in perspective. In spite of their visual prominence, even at a distance, which makes them difficult to miss, they are the only such features that we have seen, out of some 50 outcrops visited on this field trip, and then only because we were deliberately led to them. By any standard, they are very uncommon. It stands to reason that, if long intervals of time had elapsed between the supposedly-episodic lava flows, weathered horizons, and fossil soils should be common. At least one such ‘soil’ should occur in every tall (tens of meters high) outcrop. To the contrary they are rare and were most probably caused by localized processes as the basalts extruded. Figure 9. 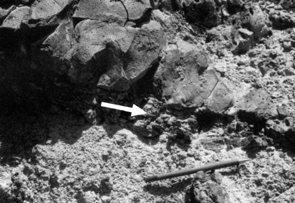 Remnant of an intracanyon basalt flow, which trapped exotic quartzite and basalt boulders below it (arrow indicates contact). In the back ground, to the left, is the Snake River, below the Lower Monument Dam. 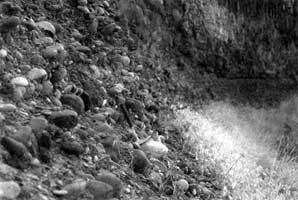 Thick gravel deposits are frequently found between flows of the Columbia River basalts (Figure 9). Most of the gravel is comprised of rounded basalt clasts, but the deposits also contain large exotic quartzite clasts from the Rockies. The basalt flows and gravel deposits were lifted to high altitudes by continuing upward tectonics. This is believed to explain the occurrence of quartzite gravel on top of the Wallowa Mountains of northeast Oregon. Some quartzite boulders in central Oregon are several mountain ranges west of their assumed source in the Rocky Mountains. We place this vertical tectonics mostly within the Abative Phase (sheet flow) of the Recessive Stage of the Flood in Walker’s39 model (see Oard44). A Late Abative Phase for the emplacement of practically all the CRBG is consistent with the exotic gravel boulders and the fact that the basalt flows are practically all sheet flows. Figure 10. Thick boulder conglomerate near Lower Monument Dam comprised of rounded basalt clasts (dark) and exotic quartzite clasts (light). The overlying basalt flow can be seen in the background. It was after the vast majority of the lava was emplaced that the deep canyons were cut, but this would have been mostly during the Dispersive Phase (channelized flow) of the Recessive Stage. For example, the Snake River dissects the basalt flows to a depth of up to 600 m. Intracanyon lava flows can be found in this valley, together with deposits of quartzite gravel (Figure 10). These intracanyon flows are quite patchy, indicating that after the canyon was cut through the basalt sheets, smaller volumes of basalt flowed into the canyons, locally trapping the gravel. These intracanyon flows make up a very small amount of the total volume of the CRBG and would be from the Dispersive Phase. It is possible that that these intracanyon flows could represent basalt that extruded from the middle of the various voluminous sheets of lava before it had time to completely solidify. In other words, the deep canyon was cut so quickly during the Dispersive Phase that the middle of the basalt flows had not yet consolidated. Additional research may help to demonstrate the speed of deposition and erosion of the CRBG. It is not likely that the intracanyon lava flows continued into the immediate post-Flood period. Too much erosion is evident for it to have occurred under ‘normal’ geologic conditions. The extent of erosion is illustrated in Figure 9, which shows a thick erosional remnant of an intracanyon flow on top of a thick gravel deposit containing quartzite boulders near Lower Monument Dam. Field studies of the Columbia River basalts reveal a variety of evidences that point to rapid extrusion, rapid cooling, and rapid succession of lava flows. Field evidences also indicate that the lavas were extruded under water. Some features that have been claimed to indicate long periods of time between basalt flows, such as ‘weathered horizons’ and ‘fossil soils,’ are very rare. This suggests that these features did not develop over long periods of time but would be better explained by nontemporal processes. The evidence is consistent with the Columbia River basalts being extruded en masse during the global Flood recorded in the Bible. In fact, the field relationships and landforms suggest that the majority of the Columbia River basalts were emplaced during the Late Abative Phase of the Recessive Stage of the Flood. This, and earlier, studies should be extended to other larger basalt flows found on planet Earth such as Karoo of South Africa, Deccan Traps of India, Parana Basalts of Brazil, and the Siberian basalts. Attention should be focused on indicators of rapid vs. prolonged extrusion and on interpreting the flows within a biblical flood model. Tolan et al., Revisions to the estimates of the area extent and volume of the Columbia River Basalt Group; in: Reidel, S.P. and Hooper, P.R. (Eds), Volcanism and Tectonism in the Columbia River Flood-Basalt Province, Geological Society of America Special Paper 239, The Geological Society of America, Boulder, Colorado, pp. 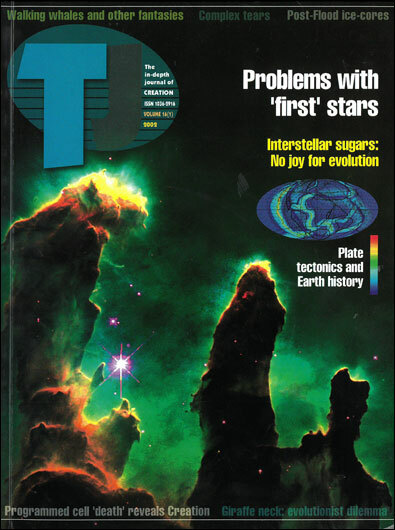 1–20, 1989. Return to text. Reidel et al., The Grand Ronde Basalt, Columbia River Basalt Group; stratigraphic descriptions and correlations in Washington, Oregon, and Idaho; in: Reidel and Hooper, Ref. 1, pp. 21–52. Return to text. Shaw, H.R. and Swanson, D.A., Eruption and flow rates of flood basalts; in: Gilmour, E.H. and Stradling, D. (Eds), Proceedings of the Second Columbia River Basalt Symposium, Eastern Washington State College Press, Cheney, Washington, p. 272, 1969. Return to text. Swanson et al., Revisions in stratigraphic nomenclature of the Columbia River Basalt Group, United States Geological Survey Bulletin 1457-G, 1979. Return to text. These divisions consist of four main subgroups, starting with the lowest: Imnaha, Grande Ronde, Wanapum, and Saddle Mountains (see Swanson et al., Ref. 4). 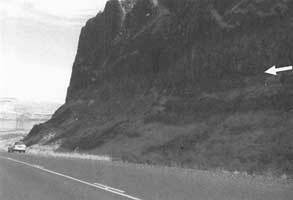 The Grande Ronde Basalt subgroup comprises about 85% of the total volume of the CRBG. Individual flows are claimed to be similar, but distinctive enough from other flows, to correlate over most of the area. The CRBG averages 1.1 km deep with a maximum depth of 3.5 km in the Pasco Basin, generally the center of the area. The CRBG thins towards the periphery, where most of the evidence for water contact exists. Interbeds within the CRBG are mainly found along the periphery of the flow (see Reidel et al., Ref. 2, p. 18). Return to text. Snelling, A.A. and Woodmorappe, J., The cooling of thick igneous bodies on a young earth; in: Walsh, R.E. (Ed. ), Proceedings of the 4th International Conference on Creationism, Technical Volume, p. 541, 1998. For primary source, see: Ho, A.M. and Cashman, K.V., Temperature constraints on the Ginkgo flow of the Columbia River Basalt Group, Geology 25(5):403–406, 1997. For further evidences and discussions concerning rapid emplacement of these basalts, see: Cashman, K., Pinkerton, H. and Stephenson, J., Introduction to special section: long lava flows, J. Geophysical Research 103(B11):27281–27289, 1998. See also: Oard, M.J., Very rapid emplacement of Columbia River basalts in non-turbulent flow, CEN Tech. J. 13(2):8–9, 1999. Return to text. Coffin, H.G. with Brown, R.H., Origin by Design, Review and Herald Publishing Association, Washington, p. 213, 1983. Return to text. Beck, G.F., Ancient forest trees of the Sagebrush area in Central Washington, J. Forestry 43(5):334–338, 1945. Return to text. Carson, R.J., Tolan, T.L. and Reidel, S.P., Geology of the Vantage area, south-central Washington: an introduction to the Miocene flood basalts, Yakima Fold Belt, and the Channeled Scabland; in: Hill, M.L. (Ed. ), Geological Society of America Centennial Field Guide-Cordilleran Section, Geological Society of America, Boulder, Colorado, pp. 357–362, 1987. Return to text. Reidel, S.P. and Tolan, T.L., Eruption and emplacement of flood basalt: an example from the large-volume Teepee Butte member, Columbia River Basalt Group, Geological Society of America Bulletin 104:1670, 1992. Return to text. Reidel, S.P. and Fecht, K.R., The Huntzinger flow: evidence of surface mixing of the Columbia River Basalt and its petrogenetic implications, Geological Society of America Bulletin 98:664–677, 1987. See also: Reidel, S.P., Emplacement of the Columbia River flood basalt, J. Geophysical Research 103(B11):27393–27410, 1998. Return to text. Reidel and Tolan, Ref. 10, p. 1650. Return to text. Cashman et al., Ref. 6, p. 27281. Return to text. Kerr, R.A., Throttling back the great lava floods?, Science 264:662–663, 1994. Return to text. Carlson, R.W., Physical and chemical evidence on the cause and source characteristics of flood basalt volcanism, Australian J. Earth Sciences 38:525, 1991. Return to text. Self et al., A new model for the emplacement of Columbia River basalts as large, inflated pahoehoe lava flow fields, Geophysical Research Letters 23(19):2689–2692, 1996. Thordarson, T. and Self, S., Sulfur, chlorine and fluorine degassing and atmospheric loading by the Roza eruption, Columbia River Basalt Group, Washington, J. Volcanology and Geothermal Research 74:49–73, 1996. 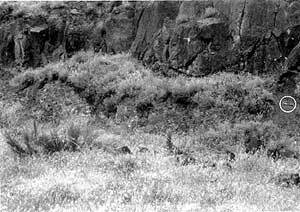 Thordarson, T. and Self, S., The Roza member, Columbia River Basalt Group: a gigantic pahoehoe lava flow field formed by endogenous processes?, J. Geophysical Research 103(B11):27411–27445, 1998. Return to text. Cashman et al., Ref. 6, p. 27285. Return to text. Reidel, Ref. 11, p. 27409. Return to text. Palagonite is a reaction product of hot lava and water, commonly replacing glass forming in subaqueous environments, such as rinds on pillows. Palogonite consists of poorly crystalline montmorillonite (clay), is greenish-yellow to orange-brown and is commonly concentrically banded. Return to text. In terms of architecture, colonnades are the vertical columns (e.g. pillars), and entablatures are the horizontal structural features, which span multiple pillars and are supported by them. In geologic usage, entablatures are the horizontal slabs of lava, which rest upon the vertically-jointed lavas (the colonnades). Return to text. Degraff, J.M., Long, P.E. and Aydin, A., Use of joint growth directions and rock textures to infer thermal regimes during solidification of basaltic lava flows, J. Volcanology and Geothermal Research 38:314, 1989. Return to text. Snelling and Woodmorappe, Ref. 6, p. 539. Return to text. Long, P.E. and Wood, B.J., Structures, textures, and cooling histories of Columbia River basalt flows, Geological Society of America Bulletin 97:1144–1155, 1986. Return to text. Snelling and Woodmorappe, Ref. 6, pp. 535–536. Return to text. Waters, A.C., Determining direction of flow in basalts, American J. Science 258-A:361–362, 1960. Return to text. Williams et al., An introduction to the geology of Verde Valley: a different perspective, CRSQ 36(2):86, 1999. Welded tuffs can also cool underwater without producing pillow structures. Return to text. Barnett, J. and Fisk, L.H., Palynology and paleoecology of a sedimentary interbed in the Yakima Basalt (Miocene), Palouse Falls, Washington, Northwest Science 54(4):259–278, 1980. Return to text. Coffin, H.G., Columbia River basalts: rapid submarine deposition (unpublished manuscript), 1996; (cited with permission of the author). Return to text. Oard, M.J., Where is the Flood/post-Flood boundary in the rock record, CEN Tech. J. 10(2):267–273, 1996. Return to text. Oard, M.J., Antiquity of landforms: objective evidence that dating methods are wrong, CEN Tech. J. 14(1):38, 2000. Return to text. Oard, M.J., Vertical tectonics and the drainage of Floodwater: a model for the middle and late Diluvian period–Part II, CRSQ 38(2):79–95, 2001. Return to text. Anderson, J.L., Pomona member of the Columbia River Basalt Group: an intracanyon flow in the Columbia River Gorge, Oregon, Oregon Geology 42(12):195, 1980. Return to text. Lava flows can have different ages horizontally as well as vertically, just as sedimentary strata can (e.g. part of the same sandstone formation can be Cambrian and part can be Ordovician). Because lava can overlap a previous flow, the same horizontal ‘level’ traced laterally can be younger than the identical stratigraphic level at another location. Return to text. Woodmorappe, J., Studies in Flood Geology, 2nd Edition, Institute for Creation Research, El Cajon, p. 167, 1999. Return to text. Woodmorappe, J., The Mythology of Modern Dating Methods, Institute for Creation Research, El Cajon, p. 9, 1999. Return to text. Woodmorappe, Ref. 34, pp. 141–142. Return to text. Alt, D.D., Profiles of Montana Geology, Montana Bureau of Mines and Geology Special Publication 89, Butte, Montana, p. 92, 1984. Return to text. Oard, M.J., What can 10,000 dinosaur bones in a bauxite lens tell us?, CEN Tech. J. 13(1):8–9, 1999. Return to text. Oard, Ref. 29, p. 272. Return to text. Camp, V.E. 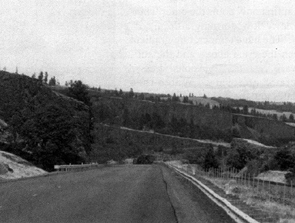 and Hooper, P.R., Geologic studies of the Columbia Plateau: Part I. Late Cenozoic evolution of the southeast part of the Columbia River Basalt Province, Geological Society of America Bulletin 92:659–668, 1981. Return to text. 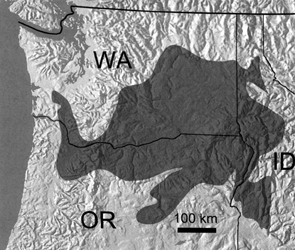 Reidel et al., The geologic evolution of the Central Columbia Plateau; in: Reidel and Hooper, Ref. 1, pp. 247–264. Return to text. Carlson, Ref. 15, p. 528. Return to text. Oard, M.J., Vertical tectonics and the drainage of floodwater: a model for the middle and late Diluvian period–Part I, CRSQ 38(1):3–17, 2001. Return to text.